I hear the danger before I see it. The hiss of a lit fuse and scampering footsteps of its enablers. I freeze, conscious that to move in any direction might be a mistake. “Watch your step,” has been the stern advice all week. “No, seriously. 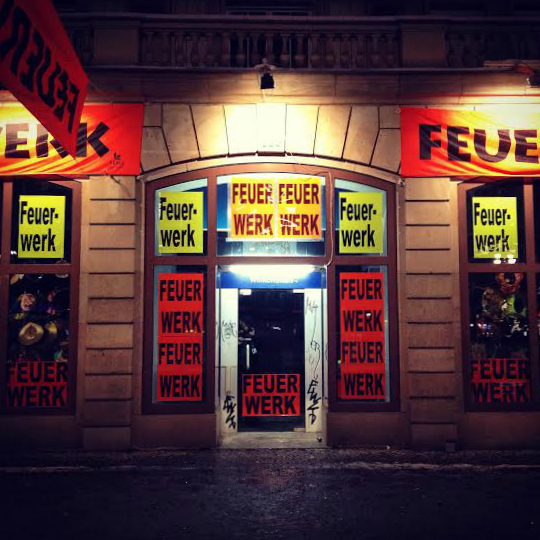 You don’t want to get your foot blown off.” Such is the joy of New Year’s Eve in Berlin. ‘Stay hydrated’ comes in a little further down the list of priorities. ‘Enjoy yourself’ further still. In any case, the pavement is wet with yesterday’s snow. And my shoes lack the traction for a quick getaway. I flinch a few seconds early, then relax – also too early. The explosion flashes and rips through my eardrums, ricocheting through surrounding streets. There was no real colour or flight to that one. No entertaining quality to distinguish it as a firework. It was basically just a bomb. But apparently that’s fine. I seem to be the only one shaken as more things start to boom and pop and fizz all around now, encouraged by the initial blast. The noise is how I imagine a war zone. Like the part right before a ceasefire deadline where everyone just wantonly unloads as much ammo as humanly possible. Only now there’s an unnerving backing track of children’s laughter. I want to yell something fusty and scornful like “Where are all of your parents? !” But I’m unarmed and outnumbered. Plus, the answer to my question is: also lighting fireworks. I keep walking. There aren’t many other options available. I’ve already showered and deliberated over shirt choice. I’m not wasting that kind of effort to turn back and sit at home. I just need to make it to the station. They can’t light fireworks on the train. Probably. I suppose there was fair warning. The sale of fireworks is illegal in Germany except for the brief window between Christmas and New Year’s. And they really make it count. In the past few days, every retail outlet in Berlin (regardless of its regular function) transformed into a pop-up arms dealership, lending some real momentum to the sense of foreboding. Waiting in line at the supermarket, children picked out their weapons of choice. And it’s not like begging for chocolate bars where the parents resist until finally consenting to “Alright, just one”. These kids were being green-lit to stock up for post-apocalyptic leisure (the arrival of which they would presumably hasten with the frankly absurd amount of explosives now in their possession). I’ve also heard that the connoisseurs source their stuff from Poland in advance. Where regulations are a little more lax and the fireworks far more powerful. For one night only there are no civilians. Only guerillas. Off the train and I’m back into a brisk stride. Shoulders hunched. Eyes darting, watering. I exit a Späti, my backpack leaden with beers. A small group of revellers walks ahead. One glances over his shoulder and drops another firework nonchalantly into my path. I rear back against the nearest wall, covering my ears. But it only spins and fizzles out tamely, mockingly. The group laughs. I soon find refuge with friends. We drink. We play Mariokart. We have dinner at a Sri Lankan restaurant. They seat us despite having open beers and generally poor etiquette. In our defence, our ears are still ringing and we’re terrified. The chosen vantage point for midnight is Warschauer Brücke. From here we’re treated to sweeping vistas of train tracks and lunatics. The crowds are packed in tight. Rockets screech at angles far too close to horizontal. Berlin is generally considered a law unto itself within Germany. A kind of decrepit playground for vagrants and scenesters. But New Year’s is something altogether disorienting. Although hundreds of people get seriously injured in the frenzy each year, police stay out of it because the chaos is so widespread. There’s simply nothing they can do. As the countdown begins, I retreat to an alternate reality so as to stave off a public mental breakdown. I mean, most people here are freaking out to some extent. But in a way that suggests their core sensation is one of enjoyment. Like schoolchildren running and screaming manically during a windy lunchtime. The crowd is buzzing on the swell of lawlessness they’ve created. Whatever. You know how a countdown works. No need to labour it. The clock strikes 12. Shells and bangers and blossoms and flares pepper the ground and sky. I damn near get my hair singed off by another low rocket. It’s a full-blown cacophony. Of course, none of us have any fireworks. Or room to move. We just keep ducking helplessly and shouting creative combinations of profanities at each other. I close my eyes and rattle through some resolutions. I’m loath to give credence to the practice but I need a distraction. Get fit. Easy. Do more (any) charitable work. Sure. Probably. It quickly descends into moral bargaining in exchange for getting the hell out of here. It doesn’t work. I am broken. It’s morning and scorch marks scar the pavement. I squint as the 2015 sun brands my retinas. On the streets, it’s calmer. Not so much an armistice as an exhaustion of ammunition. A few things still boom and pop and fizz but by now it’s mercifully intermittent. Without the same intent as before. I guess it was almost fun. In the same way running with the bulls must be invigorating. During the thing you can just about get by on adrenalin, then the real pleasure comes later when you realise you’re not dead. Still, my nerves are shot. So I’ve streamlined my resolutions down to one. To probably never do that again. Frohes Neues. Previous Previous post: Why do we emotionally invest in sport?